MXF – Material Exchange Format is an open “container” or “wrapper” format, aimed at the interchange of audio-visual material with associated data and metadata. MXF is self-contained, holding complete content without need of external material and bundles together video, audio, and programmed data. MXF is fairly effective at the interchange of D10 (IMX) material and is used by more and more professional HD camcorders like Panasonic HVX200/HPX300/HPX170/ AJ-HPX3700, Sony XDCAM, and Canon XF100/XF105/XF300/XF305/C300/C500 to store video, audio, and programmed data. However, most of multimedia players, portable devices and video editing software can not support MXF format very well. MP4 defines the storage of MPEG-4 audio, scenes and multimedia content using the ISO Base Media File Format. It is a container format that can host any type of data like multiple video and audio streams, variable framerate and bitrate, images, and subtitles. As one of the most popular video formats, MP4 is highly compatible with most of multimedia players, portable devices and video editing software like Windows Movie Maker, Adobe Premiere, Sony Vegas, Quicktime, Window Media Player, iPhone, iPad, iPod, Apple TV, PSP, Zune, etc. So is there any way to convert MXF to MP4 on Windows and Mac? Here I highly recommended MXF Converter. MXF Video Converter is an easy to use and powerful MXF to MP4 Converter, which can help users convert MXF recording to MP4 video and other popular video/audio formats with the best output sound/image quality and much faster converting speed. Also it allows users to convert MXF video to 3D video format. Now download the best MXF Converter software. 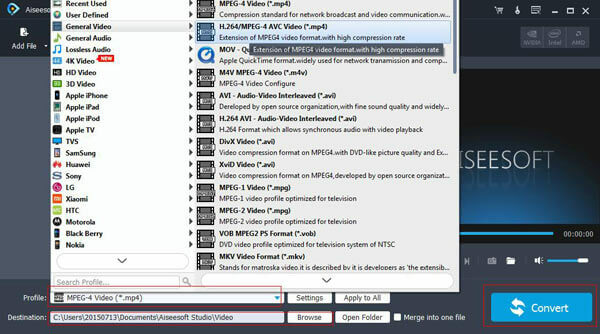 Download and install this powerful MXF to MP4 Converter, and then run it. Click the “Add Video” button or click the “Add Video” or “Add Folder” option from the “File” menu drop down list to add the MXF file. Choose the output MPEG-4 format from the drop-down list of the “Profile” column. Click the “Browse” button in line with “Destination” column to select the local folder to store the converted files. Set the output video effect, select the file(s) you want to convert in the loaded file list, and then click “Convert” Button to start converting.